In the first experiments able to mimic the crushing, searing conditions found in Earth’s lower mantle, and simultaneously probe tell-tale properties of iron, scientists have discovered that material there behaves very differently than predicted by models. The research also points to the likelihood of a new zone deep in the Earth. The work is published in the September 21, 2007, issue of Science. Surface phenomena such as volcanoes and earthquakes are generated by what goes on in Earth’s interior. To understand some of these surface dynamics, scientists have to probe deep into the planet. The lower mantle is between 400 and 1,740 miles deep (650 km- 2,800 km) and sits atop the outer core. 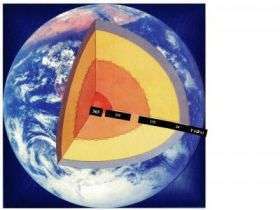 The pressures in the lower mantle are brutal, ranging from about 230,000 times the atmospheric pressure at sea level (23 GPa), to almost 1.35 million times sea-level pressure (135 GPa). The heat is equally extreme—from about 2,800 to 6,700 degrees Fahrenheit (1800 K–4000 K). Using a laser-heated diamond anvil cell to heat and compress the samples, the scientists subjected ferropericlase to almost 940,000 atmospheres and 3,140 °F. They analyzed it using so-called X-ray emission spectroscopy. As its name suggests, ferropericlase is iron-laden. It is also the second most prevalent material found in the lower mantle. Previous to this study, ferropericlase has been subjected to high pressures, but only to room temperatures. The new experiments are the highest pressures and temperatures attained to probe the spin state of iron in the mineral at lower-mantle conditions. Under the less-intense conditions of the former experiments, the high-spin to low-spin transition occurs in a narrow pressure range. In the new study, however, both spin states coexisted in the same crystal structure and the spin transition was also continuous over a large pressure range, indicating that the mineral is in a complex state over a large range in depth in the planet. Since measurements that scientists use to determine the composition and density of the inner Earth, such as sound velocities, are influenced by the ratio of high-spin/low- spin states, the new finding calls into question the traditional techniques for modeling this region of the planet. In addition, a continuous spin transition zone may explain some interesting experimental findings including why there has been no significant iron partitioning, or separating, into ferropericlase or perovskite, the most prevalent mineral in the region. The research also suggests that the depth of the transition zone is less than scientists had speculated. The existence of this transition zone may also account for seismic-wave behavior at those depths. The fact that the lowermost area is dominated by denser low-spin material could also affect the temperature stability of mantle upwellings—the generators of volcanic hotspots, such as those in Hawaii.